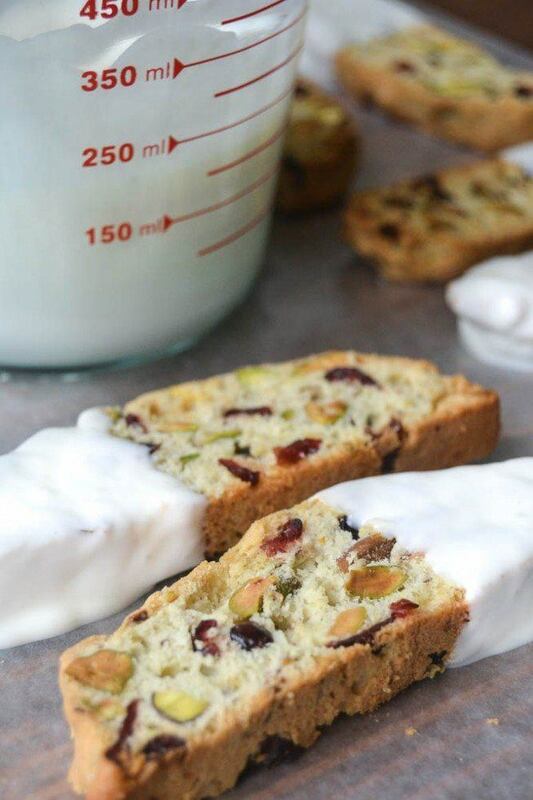 Cranberry Pistachio Biscotti ~ these crunchy cookies are a festive and easy holiday treat that anyone can make, and everybody loves! Combine the butter, sugar, extracts, baking powder and salt in a large bowl. Beat in the eggs and egg whites. I did this in a stand mixer. Fold in the nuts and cranberries, and then slowly fold in the flour. The dough will be tacky, but divide it in half, and place each half on the baking sheet, and form two loaves, each about about 8x4. It helps to lightly butter your hands. Make sure the loaves are at 3" apart so they won't merge when they bake. Cool the pan on a rack for 15 minutes. Now move the loaves to a cutting board and cut each loaf into 1/4 inch slices. Use a sharp serrated bread knife. Lay out the slices on 2 baking sheets. Bake on separate oven racks for 12 minutes, then flip the cookies over and switch the cookie sheets. Bake another 5-7 minutes. Turn off the oven and leave the cookies inside with the door closed, for about 10 minutes. Let the cookies cool on a rack before dipping in chocolate. For the coating, make sure you have chopped your bark coating into small pieces, and then put it in a microwave safe bowl. Microwave for 60 seconds, then stir. If you need more time, microwave in super short bursts of 15 seconds, until is is melted smooth and glossy. Stir it in between to help it melt. Dip each biscotti halfway into the chocolate, let the excess drip off, and then lay it down on waxed or parchment paper to firm up. Note: I find it easiest to have the chocolate in a 2-cup glass measuring cup, that way the chocolate is deep enough for easy dipping. As the chocolate level goes down, just tip the cup as you dip the last cookies, so that they get a good coating. When completely hardened, wrap the biscotti in cellophane to give or store.